Synopsis: A coming of age story about two young girlfriends. Born in England in 1945 the two girlfriends Ginger (Ellie Fanning) and Rosa (Alice Englert) come of age during the cold-war era of the early 1960’s. This is an intimate portrayal of a family torn apart by political ideology, infidelity and passion. 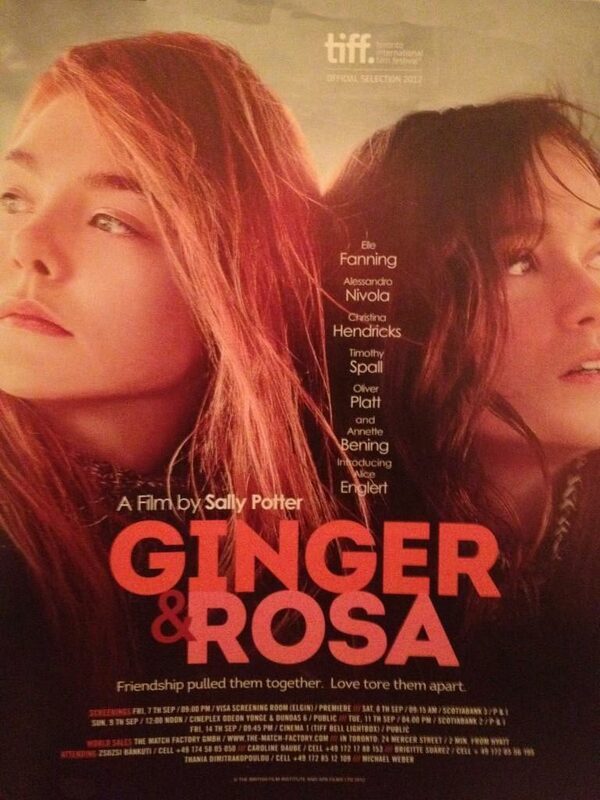 Review: Ginger and Rosa, written and directed by Sally Potter, is a film about two girlfriends Ginger and Rosa who are best friends. The film takes place in the cold-war days of 1962. The ban the bomb movement was in full swing, the Bay of Pigs incident was imminent. Ginger’s father, Roland was a conscientious objector during WWII and spent jail time for being one. Rosa’s father had disappeared long ago and she lives with her mother. The style of the movie mirrors the “new wave movement” films of the sixties with stark industrial landscapes, dilapidated apartments, hand held camera movements and extreme close-ups. More than just an homage to the films of the era, the film feels as if it were made at that time. The movie has very sparse music and like real life, the music comes and goes organically, either played on a 48rpm record or played from a juke box. The story begins showing the friendship between the two girls, they have their first cigarettes together, they sit in a bathtub together with new jeans on in order to shrink them, they iron each others hair and they share secrets with each other. As time progresses Ginger who is obsessed with the possibility of dying by nuclear holocaust, becomes both depressed about her life and at the same time becomes part of the Ban the Bomb movement. Ginger listens every night, to news reporte on the radio about the amount of nuclear weapons in England, and the pronouncements from pacifist Bertram Russell, how the bomb will be used to save England against the Russian threat and how the end of the world is drawing near. Needless to say she is petrified and thinking the end is near and joins the ban the bomb political movement. Rosa is more interested in boys and Ginger puts up with Rosa’s endless flirtations and make-out sessions. The more the two of them are together the more you realize they are moving in opposite directions. Roland, Ginger’s father, a pacifist who writes articles and journals,and teaches pacifism, finds himself trapped by his “normal” life style. He starts to have a relationship with one of his students and disappears for days at a time. Anoushka, Ginger’s mother feels neglected, and under-appreciated, and only suspects Roland’s philandering. Ultimately Roland moves-out. Roland invites Ginger and Rosa to spend a night on his boat, this is when we learn Rosa has more than a passing interest in Ginger’s dad. Ginger overhears a conversation the two are having and realizes what potentially is going on. Rosa tells Ginger that she understands Roland and she wrote him a note to tell him. Their relationship grows and Ginger is hurt to the core. Not only is she losing her friend and her dad, she feels deeply that the entire world is going end. Oliver Platt and Timothy Spall play a gay couple, Mark and Mark, who with Annette Bening’s character, May Bella, are friends of Anoushka. May Bella is also a ban the bomb activist. When Rosa becomes pregnant with Roland’s child, it is the three of them who intervene. The film is powerful and moving. Ellie Fanning, like her sibling Dakota Fanning , is a brilliant young actress who navigates through Ginger’s emotion with the stark realism the story calls for. Alice Englert, daughter of the Australian director, Jane Campion, also plays her character with realism, you can feel how her actions are dictated by an absent father. I walked away thinking about the events that took place at the Bay of Pigs and wonder if the next stand-off is with North Korea.